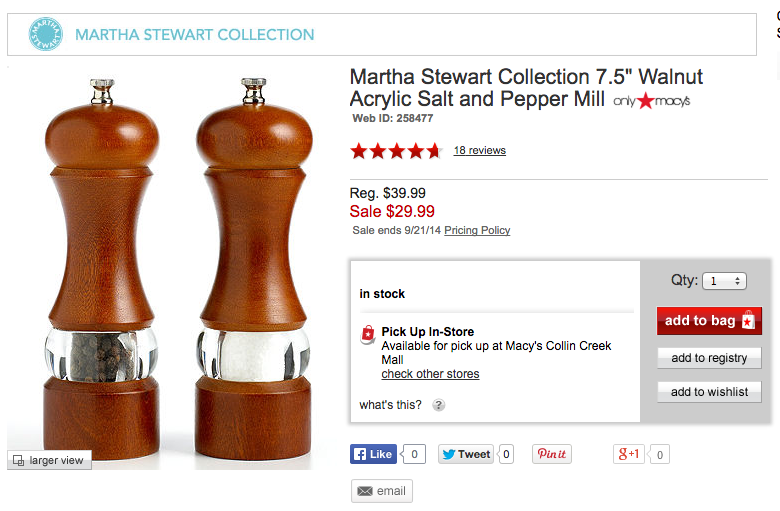 Is It Black Pepper or Toxic Foam in Martha Stewart Pepper Mill? Who Knew I was grinding away toxic materials with my black pepper using the Martha Stewart Collection 7.5' Walnut Acrylic Salt and Pepper Shaker purchased from Macy's. This is a very upsetting day for me and my family. I was making a coconut curry sauce this afternoon when I took out the Martha Stewart Pepper Grinder, which I've had for two years now and used regularly. After I was done cooking I noticed some strange looking, 3 mm black particle in the sauce. I took it out, and rubbed it in my hand. It didn't look like anything "food related" that I had added. Then I thought, well, the only black thing I added was the pepper. I took the pepper grinder and took it apart. I was shocked! There was a black foam (probably toxic material) and adhesive in the grooves/lining of the grinder! The black foam material was disintegrating and ending up in my food! It looks like my family has consumed half of this black foam material and adhesive without even knowing. It's mind-blowing to think about what ends up in our food without our knowledge. In today's society, we cannot prevent toxic materials from entering our bodies, but this one is just upsetting. I'm sure Martha Stewart or many people have no idea that this product was defective. But shouldn't there be someone controlling this? If you put your name on it, shouldn't you be responsible? Materials that are used for cooking, especially ones that end up in our mouths, should be subject to better control. This product is made in China and who knows what cheap materials they use. Does Martha Stewart knows that? I don't think so. Most of you who have this product may have not even noticed since it looks so much like a black pepper. I bet if you opened one you may find it disintegrated. It's no wonder why so many people get cancer and other health problems. I feel like a victim here. I'm very health-conscious for my family, especially now that I have a baby, and I think someone needs to take action on this sort of thing. Major product recall and health risk! The product received great reviews on Macys.com but do they really know what they were actually grinding with their pepper. Major product recall!